Eggs and bacon are not only the tastiest way to start your day, but could very well be the healthiest. A study published in the International Journal of Obesity shows that eating a high-fat breakfast could very well prevent metabolic syndrome. Not that you were going to stop eating eggs anyway. But since we’re all enjoying the morning feast, follow these 5 easy steps to make your eggs even better. 1. Good food starts with good ingredients, and eggs are no different. Fresh, pastured eggs with yellow-orange yolks produced by free-roaming chickens simply taste better than eggs from caged hens found at conventional grocery stores. If you’re willing to spend a little more, they’re definitely worth trying. Try your local farmers market or co-op, or use a website such as LocalHarvest to find your nearest source. And while you’re at it, pick up some pastured butter, too. If you can’t find anything local, Kerrygold Pure Irish Butter is a great alternative. 2. The good people at the Art of Manliness point out that “one of the more important elements to the perfect scrambled egg, regardless of the method, is air.” Scrambling your eggs well will make them full and fluffy, so use a fork–or a whisk, if you have one–to stir your bowl of eggs in a circular motion. Just make sure not to overbeat them. “You will know your eggs are ready when the mixture is evenly colored and frothy,” Matt More writes. Heat some butter and throw the mixture in the skillet and voila–the fullest and fluffiest scrambled eggs you’ve ever tasted. 4. I thought I knew how to fry eggs, but it wasn’t until I was following a recipe for sweet potato hash with fried eggs from NomNom Paleo that I learned how to make the perfect fried egg. The first step was to crack the eggs into a bowl first, instead of directly into the skillet. It’s not until the butter is foaming over medium-low heat that you gently pour the eggs in. Next, you add your seasonings and cover the pan with a lid. Two or three minutes, slide them out and sprinkle on any additional seasonings. Perfection. 5. Now that you know some hacks for making the best fried, scrambled and hard boiled eggs, impress your friends and family by learning how to crack an egg with style–with one hand. Chef John at FoodWishes recommends people practice with two golf balls with a quarter squeezed between them. Once you learn how to separate the golf balls so the quarter falls out, and practice the motion thirty times, you’ll be ready to try the technique. Check out the article and video, and you’ll be able to crack an egg with one hand tied behind your back in no time. 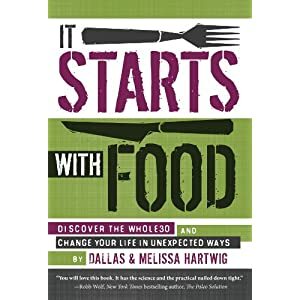 It Starts With Food, written by Dallas and Melissa Hartwig, is an attempt to explain their brand of the Paleo diet to a lay audience. The book lays out the scientific basis for the Paleo diet, including accessible explanations of “good” and “bad” foods, plus some information on meal planning and even a few recipes. Dallas and Melissa’s strength is in their delivery. Just like in their seminars, the material is presented in an engaging and accessible way. They are excellent teachers, both in their presentations and their writing. Their factual information, filled with citations, is very well-written, and presents a solid case for the Paleo diet. In the Paleo Solution, Robb Wolf laid out the case for following a strict Paleo diet for 30 days. Dallas and Melissa have taken it to a whole ‘nother level, advocating for people to do the “Whole30,” which is basically a strict Paleo diet for 30 days with a few added rules, often several times a year. This approach is a good one for people who are sticklers for detail and operate best with a lot of guidelines, with little to no wiggle room. While there’s not strict weighing and measuring of food, It Starts With Food has a framework for what should fill one’s plate (and how big portions should be), something that I haven’t seen in other Paleo books to date. And the Whole30 program has a lot of rules to follow. Bacon, once deemed a poor choice, is now permitted on the plan, as long as it’s a Whole 30-approved brand. Butter is not acceptable, but ghee is. White potatoes are completely out, even if peeled. Any foods with carageenan are out. If you’re a smoker, you should quit smoking first before making dietary changes. And stepping on the scale while on the program is prohibited. I followed a strict Paleo diet on 2 occasions–after reading the Paleo Solution, and when I wanted to try a Whole30 approach. I found that the strictness of the diet, and a slow reintroduction of foods, helped me gain a better understanding of exactly how grains work in my body. I think a strict Paleo diet (and slow reintroduction of non-Paleo foods) is something everyone should do at least once to figure out just how their body really handles things. But following strict Paleo diets on and off throughout the year for 30 days at a time is something that can lead to yo-yo dieting patterns, where you’re either doing a Whole30 or binging on junk food. Unless you’re very sick, I just don’t think it’s necessary. For many people, following the Paleo diet with a non-Paleo meal or snack a couple of times a week is probably far more healthy. For example, while some people might need to abstain from grains 100% of the time because of the reactions they have, others can handle small amounts of corn chips once every week or two. And I’ll readily admit I had a half-bar of chocolate every other week even while following the Paleo diet strictly for 30 days my first go-around…and the world kept spinning. In addition, while some people may find comfort following predetermined portion sizes, I personally will never stick with a palm-size portion of steak when I’m hungry for more, or settle for half an avocado when a whole avocado is available because I’m small (I know how my body reacts to fat and protein–and it likes it). And while there’s definitely different factors at play with the number on the scale, I may choose to weigh myself during a program or not, regardless of the rules. Lastly, I may be the only person who can’t stand clarified butter (ghee), but I don’t think I could ever force myself to eat it, so when I switch to a stricter Paleo diet (usually for just a couple of weeks at a time), real butter is included. My recommendations for someone starting a Paleo diet would include sticking to it for four weeks the first time, forgoing butter (and ghee) for the time-being… but not everyone needs to follow details on portion size, or go back to following a strict 30-day program throughout the year. And while it might be easier for some people to make food choices under very strict rules, some might prefer the freedom of looking into research as well as how their body reacts to something and making their own decisions. Others might find comfort in following a scripted set of rules determined by someone else, but it’s worth thinking through what type of person you are before jumping head-first into something. If you need to operate within very strict parameters, the Whole30 may be for you–but if you’ve got a bit of an anarchist flair, some of the extra rules may be unnecessarily stifling. We apologize for the audio! It clears (mostly) 3 minutes in, and we’ve eliminated the problem for future episodes.